From left to right: Danelle Crary, Gene Sentz, Bonnie Crary, Connor Crary, Senator Jon Tester & Dusty Crary celebrate the inclusion of the Rocky Mountain Front Heritage Act in the must-pass Defense spending bill at the Crary's ranch outside Choteau. 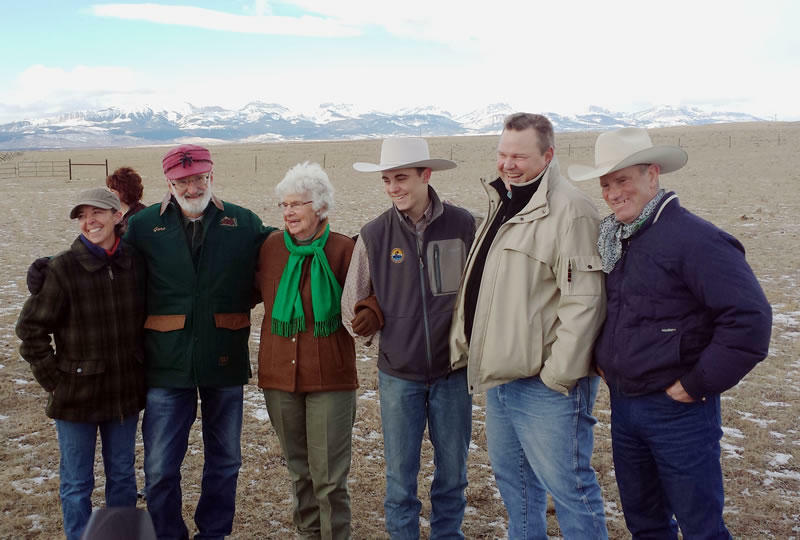 Rocky Mountain Front Heritage Act supporters celebrate passage of the bill on a ranch outside Choteau, MT. People who worked to pass the Rocky Mountain Front Heritage Act celebrated on a ranch outside of Choteau today. The Heritage Act was first introduced in Congress in 2011. Speaking to people celebrating on Dusty Crary’s ranch Thursday, Senator Jon Tester praised the hard work over many years before and since then that it took to put it together. It passed as part of a package of bills that were attached to a Defense spending bill. "We were able to get lucky, and we did get lucky. I’ll just tell you that right now," Tester said. "Things just kinda lined up. We were able to get a package of bills that I think are pretty damn impressive. And it all started with you guys." One of those “guys” was Dusty Crary, a rancher and outfitter and member of the Coalition to Protect the Rocky Mountain Front. His family has been on his ranch since 1922. He says that, before the Heritage Act passed, a lot of public land along the front was protected in the Bob Marshall Wilderness Complex, and a lot was protected in private land with conservation agreements. "And in between that was this zone of federal land that was not wilderness, it really did not have any designation on it. And so we really felt that that was jeopardizing this big picture that this ecosystem makes up," Crary said. In Congress, conservative critics of the lands package have characterized it as a “land grab.” Crary says that’s not what the measure protecting the Rocky Mountain Front is about at all. "We didn’t want to just say, well, let’s see if we can get some wilderness, and see if we can get as much as we can. We really wanted to have a comprehensive plan on this, and we knew wilderness was not only unachievable on the whole front, but it wasn’t really appropriate, either." The Heritage Act does add 67,000 acres of federally-designated wilderness to the Bob Marshall complex. But far more land, 208,000 acres, are protected in a new, unique “conservation management area” that allows traditional uses of the land like ranching, firewood harvesting and some motorized travel. It also requires federal land managers to prioritize noxious weed management on public land along the front, and to develop a new comprehensive weed management plan. The U.S. Senate has approved an expansive bill that adds new wilderness lands in Montana and blocks mining and drilling near Glacier National Park. The measures were in a defense bill that passed 89 to 11 today. The bill adds 67,000 acres to the Bob Marshall Wilderness Complex. It also allows for a complex coal swap involving the Northern Cheyenne Indians. The tribe will get back 5,000 acres of coal deposits it was wrongly stripped of more than a century ago. BREAKING NEWS: We're following up on this story and will have more on the air starting at 5 p.m. Below is the press release announcing the legislation issued this morning. In a joint press conference today, Senators Jon Tester, John Walsh and Senator-elect Steve Daines announced a landmark legislative package that includes eight Montana-based lands and resources bills. Dupuyer-area rancher, Karl Rappold, is thrilled that the Rocky Mountain Front Heritage Act has finally passed. "My grandparents and my mom and dad took care of this place. the bears and wolves and everything else. This is a historic deal for me to see that my grandkids and their grandkids will hopefully have this same view and this same region will be protected so it will never change," says Rappold. Last week Congress passed the National Defense Authorization Act which now awaits President Obama's signature.